Is Vin Diesel Voicing Groot In Marvel's Guardians Of The Galaxy? We've been hearing rumors for a while now about a potential role for action star Vin Diesel in the Marvel Cinematic Universe, and today it appears that the actor may have revealed his part. 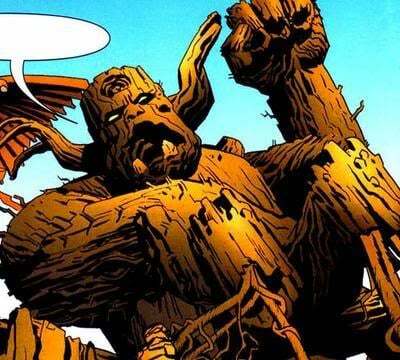 If Diesel's popular Facebook page is to be believed, he is going to voice the alien living tree known as Groot in James Gunn's Guardians of the Galaxy. Below you can find the image he posted, which came without any kind of caption. Diesel has had a mysterious link to Marvel ever since late June when he told his social media followers that he was taking a meeting at the comic book movie studio. The Fast & Furious star has teased audiences about it since, and at San Diego Comic-Con late last month he told fans during the Riddick panel that there was some very big news coming up. This very well could be the announcement. There are, however, certain factors that may disprove that this is actually an official reveal of Diesel as Groot. For starters, the Facebook post was just an image of the character from the comics that the actor used as his new cover photo - and he has since removed it (though the post is still shown on his timeline) (UPDATE: Vin Diesel now has completely removed the post from his Facebook page). Secondly, Marvel Studios President Kevin Feige spoke with The Huffington Post at Comic-Con and told them at the time that there was "nothing to announce" in regard to Diesel and that anything they had in mind was "so far ahead it may not even exist." Lastly, Marvel Studios played a significant part in this weekend's D23 Expo - the perfect venue for a big casting announcement - and they didn't mention a thing about Diesel. It's possible that the actor's Facebook post was just a tease, or even possibly just a hope. While it's unclear if this is real casting news or just speculation, I will say that I hope it is real. Diesel's voice played a very important part in one of the best animated films of the modern era, Brad Bird's The Iron Giant. Playing Groot won't exactly give him a chance to stretch his range as an actor, as the character actually doesn't really say much more than his own name, but if a tree were to start talking I would expect it to probably sound exactly like Vin Diesel. To give you an idea of what you can expect from Groot as a character, watch the clip below - which comes from the Avengers: Earth's Mightiest Heroes television series.